A sharp reversal of fortunes for the big ships as the week closed after a depressed beginning. To start with drops were sudden, with the key West Australia/China rate falling over a dollar in one day, dropping Tuesday to $7.95 before climbing to $8,50 on Wednesday and finishing the week in the low $9.00s. 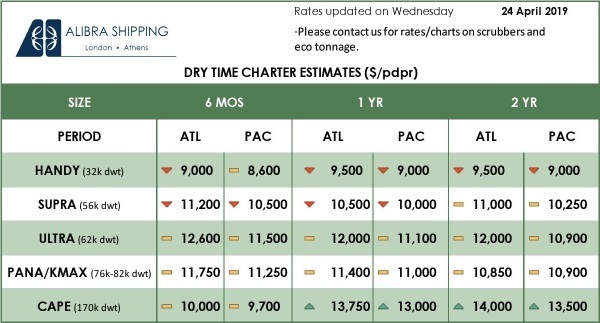 Timecharter rates also rose sharply with a well-described 180,000dwt reaching over $20,000 daily for China delivery with West Australia rounds. Brazil loaders initially saw rates change little despite Vale allegedly fixing several ships as well as CSN. Rates from Tubarao/China most of the week failed to reach $21 but Friday saw a report of a 27-28 October cargo fixed at $21.00 and rumours of a second-half November cargo fixed at $22.50. The North Atlantic market was initially very slow, but here too rates barrelled higher despite little change in cargo volumes. A good spec 179,000dwt open Gibraltar, fixed a trans-Atlantic round at $18,000 daily with Skaw-Gibraltar redelivery, or, $20,000 daily if Cape Passero and a super eco achieved $23,750 daily from Gibraltar for a run from Bolivar to Rotterdam. Last week the North Atlantic firmed as sustained demand saw a clear out of most of the prompt tonnage. Several charterers took tonnage for two to three laden legs despite paying a premium, with modern Kamsarmaxes fixed at $18,000 redelivery Atlantic. The South was a little slower than previous weeks, with attention now focused on November stems, which, seemed less abundant. 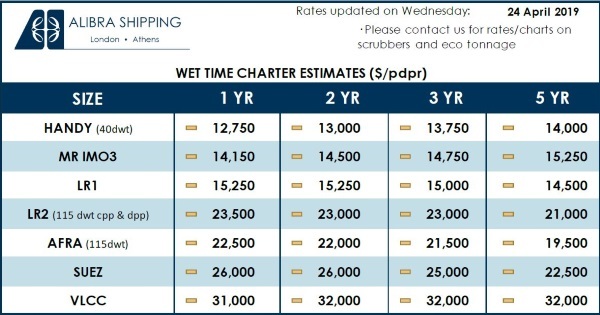 However, rates have so far remained steady, with well-described ships still commanding around $16,500 from Singapore. The Pacific began to look more positional, with very limited NoPac enquiry. The region has been underpinned by consistent Indonesian and Australian mineral demand. However, vessels open in the North seemed to be discounting to find cover. Period interest remained with several vessels now being taken in the Atlantic to cover both trans-Atlantic and front haul stems. A positive week overall with most routes seeing steady gains but US Gulf routes seeing slightly lower levels. Period activity increased with a 64,000dwt open in the Indian Ocean achieving $14,000 and a 58,000-dwt open South-East Asia fixed at $13,000, both for a short period. Atlantic activity centred on the East Mediterranean, with Supramaxes achieving in the low $20,000s for trips via the Black Sea to the Far East. There was limited activity from the US Gulf region, with a 56,000dwt fixed delivery Huelvap, via North coast South America, to China, at $21,000. East coast South America remained steady, with good cargo volumes. Healthier numbers in the Asia market especially from South-East Asia with a 57,000dwt fixing delivery Vietnam, via Indonesia, to China at $13,000. Significant activity in the Indian Ocean was evident and rates jumped. A 57,000dwt fixed delivery South Africa to the Far East at $13,500 plus a ballast bonus in the low $400,000s. The BHSI remained positive last week with stronger numbers discussed particularly from the Black Sea-Mediterranean area. East coast South America and the US Gulf continued to improve, while the Pacific market remained largely flat. Increased activity in the Atlantic basin also included a tick more long and short period fixtures. A 30,000dwt open Turkey in the second half of October was recently fixed for one year at $9,750, but excluding trading in West Africa and with redelivery in the Atlantic. A 36,000dwt open Cuba was fixed at $13,500 for three to five months. A 30,000dwt open in the Continent was fixed at about $9,700 for the same duration, while a 38,000dwt open Abidjan was fixed for five to seven months at $12,000, all with redelivery in the Atlantic. A 37,000dwt open Canakkale was fixed at $18,000 for a trip to Morocco, with option redelivery Israel at $17,500. A 35,000dwt open Iskenderun was booked for a trip to the Continent at $13,000. A 27,000dwt and a 32,000dwt, both open Singapore, were fixed for a trip to the Persian Gulf at $7,500 with steel and $9,000 with alumina. A 38,000dwt open East Australia was booked at $13,500, redelivery Indonesia, with sugar.